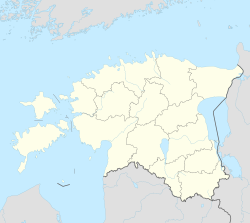 Urvaste (Võro: Urvastõ) is a village in Antsla Parish, Võru County, in southeastern Estonia. It has a population of 1 231 (01.01.2012). Urvaste church dates from the early 14th century and is the only medieval rural church in Estonia built in the form of a basilica. The interior dates mainly from the late 19th century. Tamme-Lauri oak, the thickest and oldest tree in Estonia, is located near Urvaste. Marie Heiberg had some of her education in the village and A memorial to Marie Heiberg which includes a bust of her has been erected beside the church in Urvaste. ^ Viirand, Tiiu (2004). Estonia. Cultural Tourism. Kunst Publishers. pp. 228–229. ISBN 9949407184. ^ "Memorial to Marie Heiberg in Urvaste church park". Visitestonia.com. Retrieved 17 February 2015. This Võru County location article is a stub. You can help Wikipedia by expanding it. This page was last edited on 19 July 2018, at 14:21 (UTC).